The Police Association is disturbed at what appears to be a growing trend of offenders deliberately ramming police officers and their cars, after five ramming incidents occurred in the space of a few weeks in early May. “These incidents seriously endanger the lives of the police officers, put at risk innocent members of the public and the offending drivers themselves, and they cause thousands of dollars of damage to the patrol cars,” Association Vice-President Craig Tickelpenny said. “Ramming police officers and/or their vehicles is only going to increase the severity of the charges against the offending driver when he or she is caught and as we saw in New Plymouth last month, it is a practice that can quickly turn deadly,” Mr Tickelpenny said. He was referring to an incident in New Plymouth (pictured above) where a car that police tried to pull over for speeding reversed and rammed into the patrol car and immobilised it. The pursuit was abandoned and the driver fled, only to be found dead a few minutes later having crashed into a power pole. The most recent ramming incident occurred in Taupo in mid-May. “A Police vehicle was rammed just before midnight by a fleeing driver in a stolen SUV. The two officers were injured and when they restarted their now severely damaged patrol car in order to leave the scene and wait for back-up, they were followed by the offender,” Mr Tickelpenny said. The offender was eventually tracked down and arrested at a nearby motel. In an incident a week before, a drunk Hamilton man driving erratically in a stolen 4WD ute with a horse float attached and two horses inside, rammed a Police car which tried to stop him. The driver pleaded guilty to 12 charges, including animal welfare charges after one of the horses died. officers shot out the truck’s front tyre. And in Christchurch at the beginning of the month a fleeing driver tried twice to run over two officers who had laid road spikes to stop him. 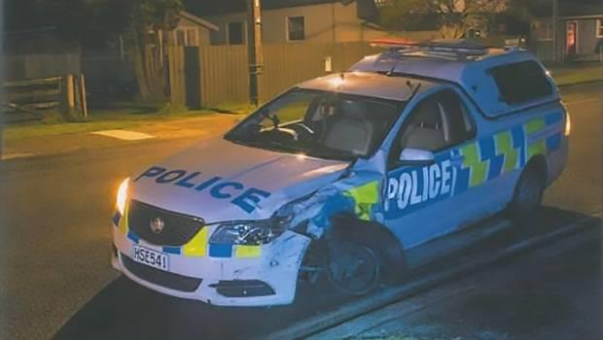 “There were also incidents in Mangere in March, Henderson in February and Northland and Tauranga in January in which officers were injured and vehicles severely damaged,” Mr Tickelpenny said. A police officer was killed by a fleeing driver in 2008 while laying road spikes in Porirua, and at the end of last year an officer was seriously injured and hospitalised after being hit while laying road spikes in the Eastern Bay of Plenty.